This mod is a dependency for my Star Wars Alien Head Pack series, but is also free to use independently for anyone that requires blue/red/green/etc. skinned soldiers. It provides two sets of base heads with extended skin colours, one with bright colours and one with darker colours. Now also includes invisible heads. The heads are available for both male and female, under Caucasian/Race 0. This has been split out my other mods so as to avoid including the same content in multiple mods. The bright colours versions use the eye colour palette to provide a suitable range of appropriate alien skin colours without forcing people to download a 3rd party skin colour mod or adding in my own. If you use an eye colour mod (like carmau's More Eye Colors), that will propagate to the base head skin colour options. The dark colours versions use the hair colour palette, and will be similarly affected by any third party hair colour mod. It should be noted that the eyebrows of both sexes and stubble on the male have been painted out. If you want versions that retain the eyebrows, you can enable these by uncommenting the C and D variants in the XComContent.ini file in the mod's Config folder (\steamapps\workshop\content\268500\822021367\). 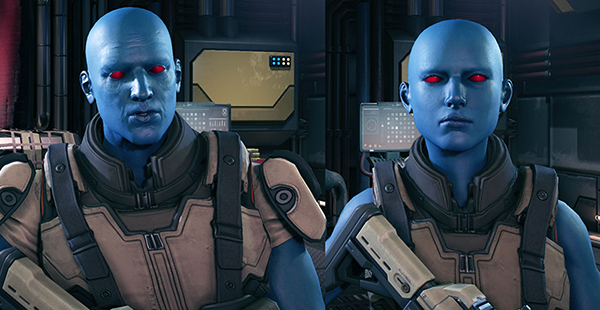 Chiss eyes for both males and females have been added under both Upper and Lower Face Props. You will likely want to enable the "hairy" head variants to use with them. You may also want to grab an eye colour palette extension mod to increase the available range of blue colourations. While I had the WOTC installed I didn't have it enabled at the same time. I double-checked just to be sure. I unsubbed this mod and then resubbed and that fixed the issue. Looking forwards to making more aliens with this cool mod. The WOTC version of the mod should not be enabled when running the legacy game. Use the Alternative Mod Launcher rather than the built-in launcher. It will tell you if there are any mod clashes. I've been having some trouble with this mod recently, ever since I installed the WOTC version. While the option appears for male characters in the base version of the game, it's gone for any new female characters I try to make (it still appears for previous characters I made with this mod). Is there a way to re-enable it for female characters? ah, thought you mighta been referring to Soul. I was replying to a now deleted post by someone complaining invisible heads didn't work. Clearly they realised the error of their ways. @DCB: I think the issue's long dead by now. It works fine. Your problem is almost certainly user error. @DCB: actually, Soul was just trying to spread the word about the shader needing an update, which was basically so cosmetc mods get fixed the fastest. I will admit doing it on several of your mods is probably overkill though. Kindly refrain from spamming all my mods about something that doesn't even come out for 2 weeks.